Drift car racing is one of those fantastic sports that gear-headed madmen perform on weekends. Most of them run overhauled street coupes, such as Sentras or Civics, with the intent to out-slide the competition in high-velocity banks that defy logic for appropriate driving. A lot of drift car competitors are also skaters, which makes sense, when we think about the stunt and trick quality of the sport. The Japanese started the whole drifting thing, and driving legend Kunimitsu Takahashi is credited with developing the techniques back in the early 1970s. Not only was he a solid motorcycle grand prix racer and formula one drive, he caught the eye of the racing world with his less-than-normal method of cornering. Essentially, he relied on centripetal force and side momentum to bank through the turns. 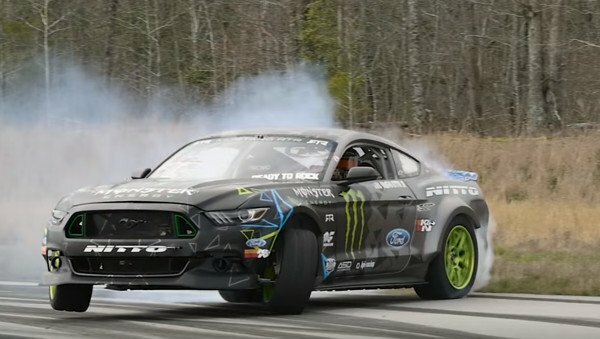 Since then, the technique has become a sport, and cars developed specifically for drifting have emerged. The cool thing about drifting is that it makes a sport out of an ill-advised maneuver. Drifters over-steer on purpose, causing the rear slip angle to outpace the front slip, throwing the car into a controlled skid. Sounds like a good time. And it is. One of the heavies in the sport today is Vaugh Gittin Jr. This year, he’s preparing to field a 900 horsepower 2016 Mustang RTR, no doubt with NOS power. With his new beast of a rig, he’s ready to take the arena by storm and dazzle the drift world with kinetically insane spectacles of raw power and speed. It would be a good time.